An elite group of nerds fight injustices by running a clandestine operation in high school. The C.Y.A., a.k.a. Covert Youth Agency, hacked into the digital school sign and posted their message: - - - If ever you're in need of help and you have nowhere else to go, seek out the C.Y.A. We're always watching and we're here for you - - - Peter "Pi" Samuels, a fourteen-year-old sophomore, runs the shadow operation. Pi's obsessed with the high school band's lead violinist, who's as beautiful as the music she plays. When she contacts the C.Y.A. to find out if her boyfriend cheated on her at a party, Pi's objective becomes clear. Prove that her beau was unfaithful. Then maybe Pi will be the perfect shoulder to cry on. Pi schemes to destroy his love's boy-toy, all while avoiding a deranged coach bent on exposing an untraceable geek squad for hire. 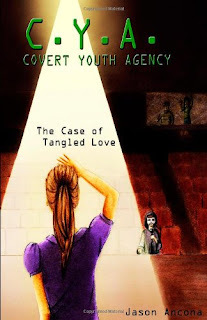 The Covert Youth Agency. I have to say that this cover drew me in with the girl in the spotlight. It seemed to flow well with the title! Upon opening my copy of this book, my first thought was that I loved the concept of "nerds for hire". Pi was an intriguing character and I was ready to dive into the story. As the synopsis mentions, the Covert Youth Agency (or CYA) are a group of students who would probably be considered to be the "underdogs" in most situations. Pi and his friends are the nerds at school, but they use their immense brain power for good rather than evil. Good thing too, considering the fact that they know how to hack into the school files and so much more. This "untraceable geek squad", as Jason Ancona puts it, is not to be reckoned with! Our narrator is mainly Pi in this story, although Vera's thoughts occasionally make an appearance. Pi is a great kid, a loyal friend and a top notch student. He flies under the radar with the greatest of ease. The one chink in his armor? Vera. She's the high school band's lead violinist and the absolute object of Pi's affection. Before we are introduced to Vera, we see that Pi uses the CYA to help the other "underdogs" of the school. Any students who can't seem to get themselves out of sticky situations (especially bullying) are steered towards the CYA and their intelligent tactics. Once Vera steps into the picture though, Pi falls head over heels and hilarity ensues. Overall I really enjoyed this story. Despite the spots where the plot dragged a bit, the story was well written and full of fun plot twists. The banter between Pi, Lightman and Tollhouse was definitely my favorite part. These three are perfect examples of how really good friends interact. There were portions of this book where I couldn't stop myself from giggling at the way they picked on one another. I love when that happens! What was most difficult for me were the heavy narrative portions of the book. This is what tended to slow the pacing down in the book. Still, I realize that for the voice of this book it was a necessary tool. The bright side is that the reader gets to know Pi and his friends very well, and it makes the characters much more believable and relatable. Filled with mystery, hilarity and of course some tangled love, this book did end up quite an enjoyable read. It also happens to be a rather short read, which makes it perfect lazy weekend reading material! I'm extremely pleased that this book was put on my radar. I look forward to seeing what Pi and his friends get into in the future. I'd recommend this book to nerds, lovers of nerds, and anyone who doesn't mind giggling like mad while reading.